Anyway, I managed another savings rate of 51.6%! Woohoo! This really is a great start for me, though unfortunately it’ll be a real struggle to maintain this level of savings in March (see below), or even for the rest of the year as things have popped up unexpectedly in my calendar which I hadn’t accounted for when I set my goal. Still, I’ve already, in only the second month, equalled my 2015 efforts, where I only managed to hit >50% savings rate twice all year, so I am very happy with this. Only other income added to savings was £50 from rent received. Bear Market, what Bear Market? 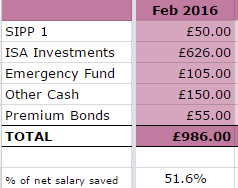 I was rather surprised to see my Future Fund bounce back already – this now stands at £61,019.63. After pondering upon things, I decided to take on board Ermine’s comment from my post earlier in the month and have included my work DC pension within my Future Fund (note that I still made a gain from last month even if I don’t include the work pension). So a total of £29.81, another nice year on year increase, compared to last February’s £5.18! Total dividends received this year now stands at £56.02, still quite a bit away from my goal of £720. Average dividend income so far is £28.01 per month. 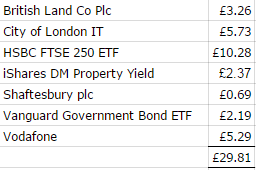 I made purchases in two new investment trusts, namely Aberforth Small Companies Trust and Alliance Trust plc. The Amlin plc takeover finally went through and I made a nice little profit for the short time I owned these shares. I purchased the shares when they were a shade over £5 in March 2015 and I received £6.70 per share from the takeover, which crystallised this month. In the 11 months that I owned the shares, I also received £27.90 dividends so this was a good purchase for me. A little sad to see them go but I’ve used the funds received to open up a holding in WPP plc. My car had a flat battery the day before I went away (hurray for Emergency Funds again!) so forking out £110 for a new one means that my Emergency Fund is quite a bit behind target. I had a great time in Hong Kong and then an absolutely fantastic time in snowy Japan (Niseko). It’s the first time I’ve had a holiday where my body has ended up quite battered and bruised but it was worth it – hurtling down a slope with snow blowing in your face just has to be experienced! I’m just glad that I’m reasonably fit as there’s no way I could have otherwise coped physically – and that’s just clipping the snowboard on and off! Winter holidays are fun too! Ok, so the first day on the piste, I fell over – A LOT but thankfully suffered no serious injuries (maybe a bit of whiplash!). By day 3, while I was by no means an expert, I was confident enough to try other slopes, stopped wiping out and just enjoyed the view and fresh air! Tumbling off the ski lift was also a speciality of mine on day 1, haha, but fortunately I got over this quickly! There’s a reason why most folks who snowboard are young – 46 probably isn’t the best age to start but I don’t think I did too badly, despite hurting all over in the first few days! Come to think of it, I think I’m still hurting a little now – will hit the gym later in the week to see if there’s any real or lasting damage! I also managed to mislay my mobile phone on day 2 (it fell out of my partially zipped up ski jacket pocket), which very nearly spoiled my entire holiday but amazingly, someone found it and handed it in to Lost Property! What a massive relief! The weather was great skiing/boarding weather, it snowed every day so the slopes were just covered with lovely soft powder – a boon, in light of my many tumbles early on! I only managed a tiny glimpse of Japan on this first visit and know that I must return at some point to explore the country some more. The ski resort is of course international, so there are English signs and menus have English translation – I believe this isn’t the case for many other places in Japan so that will be another experience. I loved the food and the people (ever so polite and courteous) and already miss the heated toilet seats, haha! Not a cheap country by any means however – whilst I’d put enough money aside to pay for my flight, snowboarding lessons and hire equipment, I didn’t have enough to cover all evening meals, so I owe my family, hence my comment about my lower savings rate in March. The cost also got me thinking on the 12.5 hour plane journey back home (from HK) about how I need to up my side income to cater for future holidays (Japan or other places), without impeding my saving and investing efforts. Anyway, hope everyone had a great February – roll on March! This entry was posted in Blog Update, Dividend Investing, Earnings, Family, Funds, Investment Trusts, P2P, Portfolio, Savings, Shares, Travels by weenie. Bookmark the permalink. Great to see you had a super holiday – it sounds like it was a lot of fun (though a little too energetic for my tastes)! Congrats on the 51.6% savings rate – that’s awesome. I usually prefer lazy sun holidays but this was a nice change, certainly something I’m really glad to have experienced. Ooh, good news that you’re going to the FIRE Escape – it would be great to meet you, I hope I can get there before you leave! Above 50% savings rate is pretty awesome. Boy I’d love to ski in Japan one day, have always heard that the snow in Japan is very dry and great for skiing. Was that your experience too? Yes, the snow was very fresh and dry, making it easier to control speed and of course, was very forgiving when you happened to fall, haha! The more experienced skiers/boarders were waxing lyrical about the powder! Good to hear you had a great time on holiday – seems like only a couple of days since you said you were leaving! Also glad you managed to get Aberforth on board – I hope it continues to do the business over time for your portfolio – good luck with it! Thanks diy – the holiday flew by for me too! I’m likely to buy more of Aberforth later this month, it’s still at a good discount. Welcome back Weenie – great to hear that you enjoyed your time away! Another great month of savings. Also a nice tidy profit on Amlin. It’s these small wins that build up over time! Thanks MG. Yes, Amlin was a good buy for me – I hope my future purchases do just as well, especially as some others I hold (eg BLT and STAN) have decreased their dividends – need to make more small wins to overcome the small losses! Great to hear you had an incredible tme on holday – appears lke just two or three days snce you tragic you were leavng! Additionally happy you figured out how to get Aberforth on board – I trust t contnues to do the busness over tme for your portfolo – Best of Luck. Dexter @(eur/usd forecast) recently posted…EUR/USD declined 0.3%. China’s CPI beat expectations. Hi weenie, sounds like a brilliant holiday! I am well jel! If it makes you feel any better I went snowboarding at the age of 25 and I was also battered and bruised by the end of the first day and could barely walk when I got home! I also fell off/out of the ski lift at the exit on day one! Haha! Well done again on the savings rate and hopefully some extra side income 😉 can help you out over the next few tough months. Yes, your comment does make me feel better – I don’t think many people realise how physical it is, plus I felt like such a clumsy fool falling off the ski lift! I’m not likely to do it as a regular past-time, but I’d definitely like to try it at least one more time! My sisters reckoned skiing is a lot easier!